By Rob Smith: Manny Pacquiao and his promoter Bob Arum still haven’t selected an opponent for a date for Pacquiao’s next fight. All that is known now is that the fight will take place at the MGM Grand in Las Vegas, Nevada on either November 10th or December 1st. We know that Pacquiao will chose amongst three fighters – Miguel Cotto, Tim Bradley or Juan Manuel Marquez – picked out for him to choose from by Arum but there’s still no word who that guy will be. Michael Koncz, the personal adviser for Pacquiao, had said that the name of the opponent could possibly be revealed this week, so hopefully they can finally say who the guy will be. Cotto’s name is mentioned but the chances of him getting the fight are so slim that it’s not even funny. Cotto has already booked Madison Square Garden in New York for December 1st, and Pacquiao and Arum won’t likely agree to fighting in New York because of the State taxes that would be taken out if the fight took place there. Nevada doesn’t have state taxes, which is why the fight can only take place there and that’s not going to happen with Cotto having already booked Madison Square Garden. The only choices for Pacquiao’s next opponent are Bradley or Marquez. It’s pretty clear that Arum seems to favor the soon to be 39-year-old Marquez because he helped bring in 1.4 million pay per view buys for Pacquiao’s last fight with him last November. That number was double the 700,000 PPV buys that Pacquiao-Bradley brought in last June. Just doing the math it suggests that Marquez is overwhelmingly the favorite to get the fight with Pacquiao. 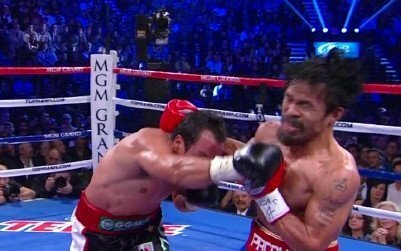 The only thing that could get in the way of that fight taking place is Marquez wanting more money that he got last time in his fight against Pacquiao. If Marquez takes more money then that money will need to be subtracted from somewhere, meaning that Pacquiao or Arum could get a smaller payday than last time. That could be enough to keep the fight from happening, although I still think Marquez will almost surely be the guy that gets picked. They won’t want to risk getting even lower PPV numbers for a Pacquiao-Bradley rematch than last time. Next boxing news: Mike Tyson Vs. Evander Holyfield: Which Fighter Has The Greater Legacy?